A professionally printed banner and poster is one of the most reliable marketing tools in the industry. If you want your customers to notice and leave a lasting impression about your brand, you need to invest in one. This is also a great marketing tool to use if you want to spread the word about an upcoming event, or a promo that you have to offer! The standard sizing for posters and banners can include a selection of the following: 18” x 24” or 24” x 36”. If your marketing needs require other sizes (big or small), you can reach to us directly to learn more about your options and the corresponding prices for each customized size and options. It is also a smart idea to print banners and posters in multiple sizes. Hence, you can speak to your customers in the most effective manner based on your needs. For example, if you are going to attend a bazaar or convention, the extra long or wide banner is an effective way to get noticed. Meanwhile, if you have a store and you want to capture the attention of your customers, a medium sized banner should get the job done. You can work with us to create a unique design for your banner template. There are hundreds of banner designs to choose from – if you lack the expertise, you could spend thousands of dollars on your banner design that won’t bring in results. But if you want to choose the right design to match your brand and the intended message, you need the expertise of a professional to address your potential customers the best way possible. The perspective is just as important with the message being conveyed when you print business banners and posters. You need to carefully study where you intend to place your banner or poster for maximum effect and exposure. 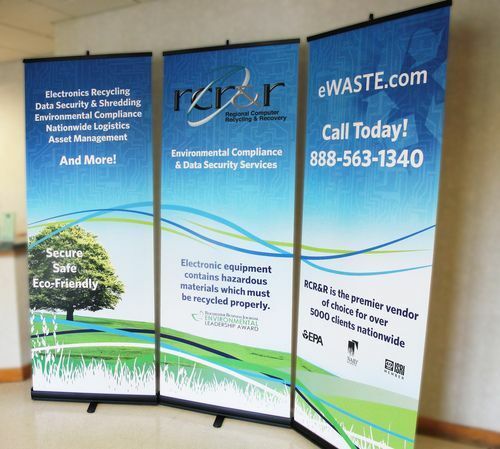 When you order custom printed banners and posters, you need to determine the configuration of the banner – it could be printed in a vertical or horizontal format. Which is better: banner or poster? Not sure if you need a banner or a poster? A banner and poster might seem like the same and one, but they are not. To maximize these marketing tools, you have to know the difference. A poster is mostly in A3 size format and typically comes in a vertical square shape. Meanwhile, a banner can be larger and almost always comes in a rectangular shape. You can use poster to display generic messages about your brand, or let your prospect customers know what your brand is about. On the other hand, a banner is often used to promote special sales, new releases and other types of promotions. Let us know what you need and we'll get in touch right away! ​​Call 214-977-7458 or send us an email!